International Business Times, Aug 28 2016, Madhya Pradesh: Bihar chief minister Nitish Kumar has extended support to the Narmada Bachao Andolan (NBA), ahead of a crucial meeting on August 31 of the Narmada Control Authority’s (NCA) environmental sub-group, consisting of representatives of the Centre. 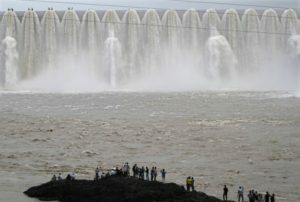 The meeting that also includes three “beneficiary” states, Gujarat, Maharashtra and Madhya Pradesh, is set to decide on finally closing down the 30-odd gates installed around the dam. For the last one month, NBA has been protesting against “fake rehabilitation” by the Madhya Pradesh government. Led by Medha Patkar, the NBA that was founded in 1989, has been fighting relentlessly for the rehabilitation of more than 15,000 Narmada dam oustees, who have not received any package for resettlement. Sources suggested that Nitish Kumar will reach Badwani in Madhya Pradesh on September 16. Kumar’s Janata Dal (United) and its senior leaders such as KC Tyagi and Sharad Yadav have lent support to the anti-dam movement. Kumar had also criticized the Land Acquisition Act, 2013, rejecting PM Narendra Modi’s advice to states to drop consent and social impact assessment clauses. Dr Ahmed wanted to hear the perspective of the displaced persons on a number of issues including their views on the catchment area treatment, alternative afforestation, impact of the dam on low lying areas, sand mining along Narmada river, possible rise of submergence level as the dam’s 30-odd gates are closed, and possible impact of a severe earthquake on the dam. “We warned him (Ahmed), there is genuine fear among the oustees that if the dam’s gates are allowed to be closed down, people would intensify their struggle,” said Rahul Yadav, senior NBA activist. “They told him that the state government is not offering agricultural land to the affected oustees and that the rehabilitation sites are not upto the mark. They (the oustees) also said that the calculation of the impact of Narmada dam flooding, once gates are closed in the submergence areas, is not correct and that fisher-folk have been left out of any rehabilitation package”, Yadav said.